If you like donuts there's a good chance you like Pizza. In fact, most fans of donuts and Pizza would be hard pressed to deny that they try to find ways to incorporate these 2 "food groups" into each and every day. How many times have you heard, or said for that matter, "I could eat Pizza every day of my life." or "why can't donuts be served with every meal? "...you know you have said that. Well, many enterprising business people have heard the call and taken you up on that charge by creating shops that sell not just one, but both of these delicious items. 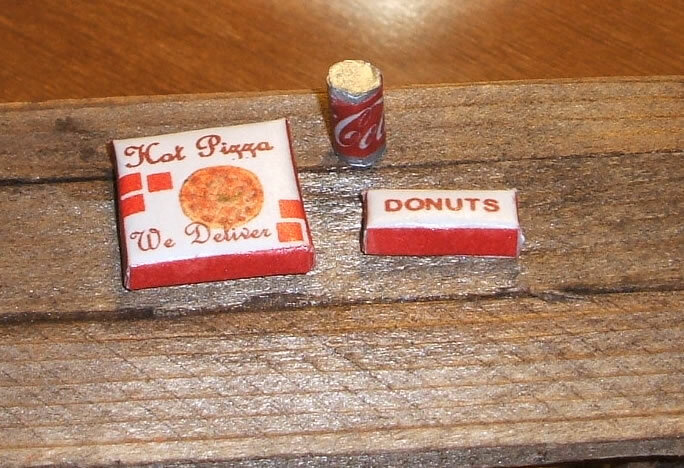 Pizza and Donuts- what a combo! This Memorial Day weekend, while out and about donut hunting, I decided to try one such place in Auburn, Maine, Georgios Donuts. I've been waiting for quite a while to have an excuse to try this place and this weekend's trip to Bar Harbor was just the reason to justify the 4+ hours drive. On a side note, there are no homemade donuts in Bar Harbor save for some imitation rings disguised as cider donuts...do not try these...they will hurt you. Georgio's which has been in the same location since the 1950's, has been turning out donuts and za to please the masses Monday-Sunday like clockwork. To quote the jovial man behind the counter..."I don't know which came first, the Donuts or the Pizza, but we've been here for 60 years." They must be doing something right and obviously have a loyal following. Having tried donuts all over the region I must admit that the raised donuts, a Jelly and a glazed, were less than the best this donut hunter has consumed. The Jelly, more of a glue than a jam, was too artificial tasting and the dough was more bread-like than light and fluffy. If you want a good find at Georgios stick to the cake donuts. Their wide variety of flavors can tempt the most adventurous and you'll get one 1/2 off with a cup of coffee (which was too watery on this particular day). I didn't try the pizza and if I was asked to make the drive again to test it out I would sadly say no. But, I guarantee you if you're in northern Maine and itching for a homemade donut that you should pass up Tim Horton's and grab a Chocolate Dutch Crumb from Georgios...it will help easy your pain. I have a friend named Whipple. Whipple lives in DC. Whenever I receive a random email from Whipple, laughter ensues; this was just such an event. Ever since I got Whip hooked on riding motorcycles he also managed to tune his sensibilities to the wonderful world that is donuts; I talk about them and need to stop for several whenever we are on a trip, so it just happens. This random email happened to have the subject heading: "DC's inaugural donut run..." I knew it was sure to be a winner. I know what you're thinking, "What is a donut run?" "And if it is what I'm thinking, why would anyone do such a thing?" Well, why wouldn't you? These are donuts after all. I decided to do some more research into this pressing matter and have some astonishing news to report. A basic search will bring up everything from Episode 11 season 2 of the Veronica Mars show, to the Toronto Donut Ride, to the demise of Brown Universities Naked Donut Run; though reports have it that some enterprising students have found loop holes in the public decency laws so as to keep that one afloat- THANK GOD!! It seems that, in almost every way possible, we have incorporated our favorite little spud nut into a clash of health, exertion, hilarity and indigestion by eating 12 and then running a 5K, the basic donut run model. The only thing I'm disappointed about is that Boston does not yet have a donut run..hmmm. 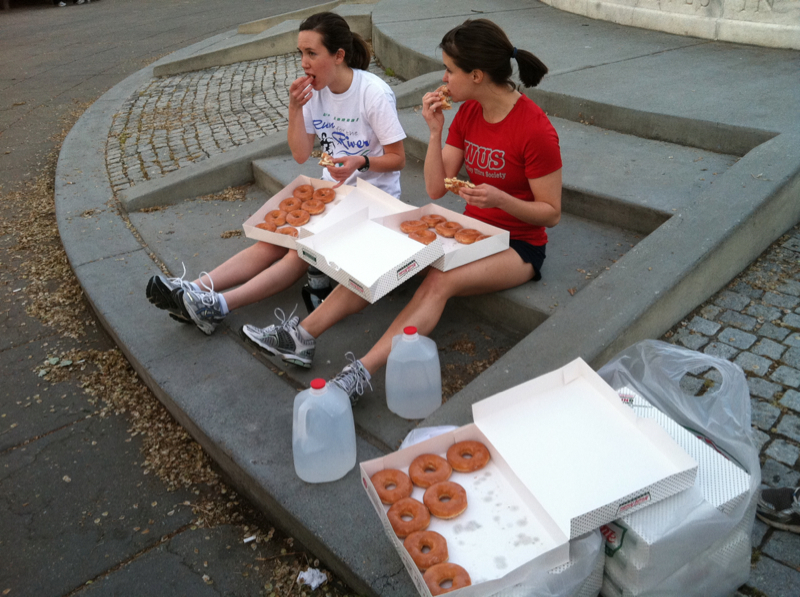 Yes, we have runners using donuts as pre-race fuel for the Boston Marathon, but we need an event for real people, people who don't care if they make it to the finish, love to eat themselves silly and purge only to do it again, people who would eat a dozen donuts and then do the farthest thing from sanity possible- RUN! Sounds like just the kind of event Boston needs; more to come. Don't Get a Divorce...Get a Donut!! Every once in a while we find a nugget of advice so profound that we can't help but act on it immediately. Donut Prince, Burbank CA, has just such a nugget of wisdom to share; and I'm booking a flight to go test it first hand. Don't get a Divorce...Get a Donut!" In an effort to stave the increasing divorce rate and bond already tight couples closer, the couple who own and operate the Donut Prince not only proclaim this loudly throughout their commercials, but also have the slogan displayed in plain sight. They are open 23/7, and can you guess what they're doing during that 24th hour...huh? huh? Oh ya, makin' donuts! No marriage would fail with this kind of concrete holding it together. START EATING!!! It's George Lopez's favorite shop and I'll leave you with this to find out why. Donut Music, but of course! As I've been traveling lately the Monday Nut has been brewing and will return next week; so I'll leave you with the Friday Nut instead. Whenever I want to find something interesting new an innovative, I can usually count on Asia; donuts are no exception. Either something is completely lost in transalation, other than me, or the writers of this tune love donuts so much they decided to let the world know; whatever it is these girls are psyched. If anyone can translate this please let me know, and it does not have to be literal :) Enjoy!